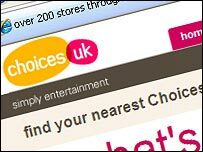 Entertainment retailer ChoicesUK is to call in the administrators - leaving hundreds of jobs under threat. The Peterborough-based firm said it had made the decision after attempts to refinance or sell the group had failed. ChoicesUK employs about 1,700 staff at its 170 stores across the UK as well as its website. In April, the group warned the tough DVD market meant it was expecting bigger-than-expected losses despite a huge cost-cutting push. The group is currently in the middle of a restructuring drive which aimed to save up to £6m. The measures had led to the loss of 250 jobs since September and the closure of a number of loss-making stores. The group reported pre-tax losses of £2.6m for the six months to February, and in April warned it was reconsidering its options after its financial position had declined still further. "Until very recently, the directors were hopeful that a successful outcome would result," the group said in a statement. "However, despite extensive negotiations, it has not been possible to reach an agreement on terms acceptable to all parties. "Therefore, the directors have decided that it is in the best interests of the creditors to seek to appoint administrators as soon as possible," it added. The company is expected to continue trading as normal at its stores and website until administrators are appointed and decide what action to take. The group's shares were suspended at 10.25 pence on the London market following the news. At the end of 2003 they were trading at 240p. ChoicesUK has blamed surging piracy for its problems, with its DVD rental business hardest hit by the availability of pirated new titles long before their legitimate release date. Meanwhile, mounting competition - from both supermarkets and digital music sales - has also taken its toll. ChoicesUK is not the only High Street name to suffer from the changes in the entertainment market. In June, independent music retailer Fopp went into administration, with the loss of 700 jobs; while pre-tax profits at big name rival HMV more than halved to £48.1m in the year to 28 April.